While solar power is decades old technology and solar panel systems have been used on homes for before the millennium, the solar shingle is relatively new. Dow Chemical first sold them in 2011 with their PowerHouse line. There’s just a handful of other manufacturers and distributors that include CertainTeed (Apollo line), SunTegra, Atlantis Energy (SunSlates), and the latest Tesla. Dow left the market in July 2016, which is around the time Tesla announced they are entering the market. Dow was the king of the heap, but Tesla offering has been mostly a vaporware thus far. 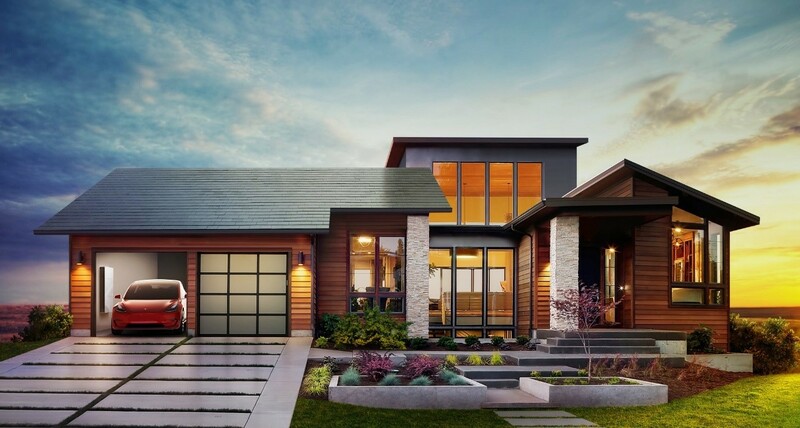 It’s not possible to discuss solar shingles for the residential market, and not mention the Elon Musk factor, owner and CEO of Tesla Inc. There’s great reason for optimism with Tesla entering the market, after their acquisition of SolarCity. However, they aren’t officially distributing product yet, so there’s also reason to be skeptical. But we’ll get to that in a moment. If you go to Tesla.com, the first thing you’re asked to consider is “Get Updates.” The latest word on the street is the product will start being available in the mid 2019. Next on the site comes announcement of the Powerwall 2 and the Solar Roof. Or as Musk would put it, his desire to make all roofs beautiful, affordable and powerful. Via the solar shingle of course. The Powerwall 2 is the second generation battery pack for the solar roof. It ought to be made clear that Tesla is creating an off-grid solution to solar power generation for homeowners. The Powerwall 2 includes inverter and with an accompanying solar roof, can supply power to an average 2 bedroom home, along with your electric run vehicle. Everyone has a Tesla car, right? This makes for some monumental shifting of not just solar products in the residential market, but also roofing and home energy use. We urge you to check out the following video that uses prototypes of the solar shingles to show their ultimate status in elegance and durability. Going as far as to say even before savings from the power bill. For the clay tile and slate options in their line, that’s theoretically possible, given mass production and ease of installation. With the asphalt shingles, costing on average (at most) $350 to $550 per square installed, or per 100 sq. ft. — then it’s really challenging to take Musk as serious. 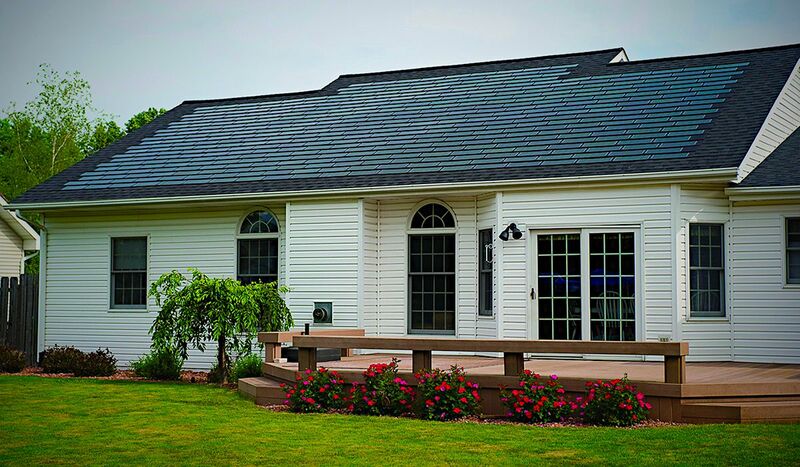 Fortunately, the other manufacturers that currently do have product available in the market, and who will be Tesla’s competitors, provide us opportunity to explore the cost of solar shingles. Current solar shingles and tiles are installed in similar way to asphalt shingles. Instead of having the asphalt shingle as the entire roofing system, a combination of asphalt shingles and solar shingles make up the roof. A typical installation uses 350 solar shingles for a roof, so as to generate enough power for the home. Larger homes, with presumably more energy needs, would have more shingles. The total cost of installation, going with 2016 numbers is about $30,000 or about $25 per sq.ft. Installation must take into account electrical work, possible permits, provisions for warranties, etc. The $30,000 figure though actually is lower. Arguably considerably lower. First consideration is the federal rebate via EnergyStar.gov, which as of Jan. 1, 2017 is slated to go through 2021. For the first 3 years of the federal program, you can obtain a 30% rebate if you apply to the government. So, $30,000 then becomes $21,000. Then if you add in the savings on your energy bill, which on average is 50% reduction, the $21,000 number gets lower, and lower, over time. Yes, you still have a significant upfront payment, but not going solar means you still pay 100% of your current energy bills. And all of this assumes you are staying on the grid, or relying on your regional utility company to produce power when the current lot of solar shingles isn’t producing enough output for your needs. Within even 5 years, the idea of not covering your entire roof with solar shingles to produce all the power your home will need will quite possibly be considered very old school. Or how an iPod today almost seems like a relic of days long gone. First consideration goes back to cost and value of solar shingles installed. The ROI for solar shingles is currently thought to be between 70% and 100%, depending on the type of installation, presumably more for how well integrated and less noticeable they are. Therefore, for the $30,000 spent, you can count on immediately having an added value of $20,000 to your home. Warranty is another big consideration. A typical asphalt shingle roof generally is warrantied to last 5 to 10 years for labor and 20 years for materials. PV solar panels usually have a 25 year warranty. Solar shingles are essentially too new to have a known warranty factor that can for sure be backed up, however the panels installed as much as 60 years ago still perform OK. That bodes very well for solar shingles where they could outlast asphalt shingles on the same roof. And it’s well understood that with solar power, shingles or panels, there’s virtually no maintenance since there are no moving parts. With panels though, there is inherently better opportunity for efficiency, as systems can be made to track the movement of sun across the sky. Can’t do that with shingles and tiles. Yet, that would also mean maintenance is more likely at some point since the mechanical gears will eventually wear down. A caveat that needs to be mentioned is the product can’t be seen as necessary for everyone regardless of the hype. At least not initially. If your existing roof is 10 years old or less and presumably in great shape, it would not be cost effective to install solar shingles. Even with Musk’s optimistic vision, he sees people going with solar when they need a new roof. Therefore the traditional (read as non-solar) roofs being installed this year, could be waiting another 25 years before justifying the shift to solar shingle. And that’s assuming the roof is of the tile variety (asphalt shingles, clay tiles, or slate). Another caveat relates to why Dow left the market. Solar panels are still the cost effective, most efficient product on the market. Dow, and much of the other players in the market today, are using thin-film solar modules. The conversion of sunlight into energy is lessened by going with these type of solar cells. Dow estimated by 2015 they’d be making $5 billion annually from this product and as much as $10 billion by 2020. Only to realize the market just wasn’t there yet, and so they abandoned the product line in 2016. Hence, there is reason to be skeptical that Tesla can for sure do what Dow couldn’t. It’s great news that CertainTeed is in the market, as they have history as a business that’s over 100 years old. All the other manufacturers are companies that most people have probably never heard of. Finally, one might think that solar shingles could be rendered ineffective if covered. Yet, of all the elements that could conceivably cover your roof, smog would be the worst culprit when it comes to solar. With snow, the solar shingle system could generate enough heat to melt snow as it falls, shedding the melted snow as water which all sloped roofs do anyway. Musk has indicated he sees his tiles having built in function that would work in similar fashion to rear defroster on your car. Leaves can be blown off either by wind, or by tools we use currently to blow leaves off our lawns. Smog, on the other hand, would leave a fine dust that would make for less than optimal efficiency. This would then take a washing which rain could handle, but is perhaps better handled with a simple garden hose and soapy water. As durable as solar shingles are, it would never be a good idea to use a pressure washing system on such material, especially as a light rinsing is all that is likely necessary. If still not thoroughly convinced at the durability that solar shingles can handle, take a look at what CertainTeed has on their site about what their Apollo II solar shingle has proven to withstand. Less efficient than solar panels. And unlikely to be more efficient than panels anytime soon.